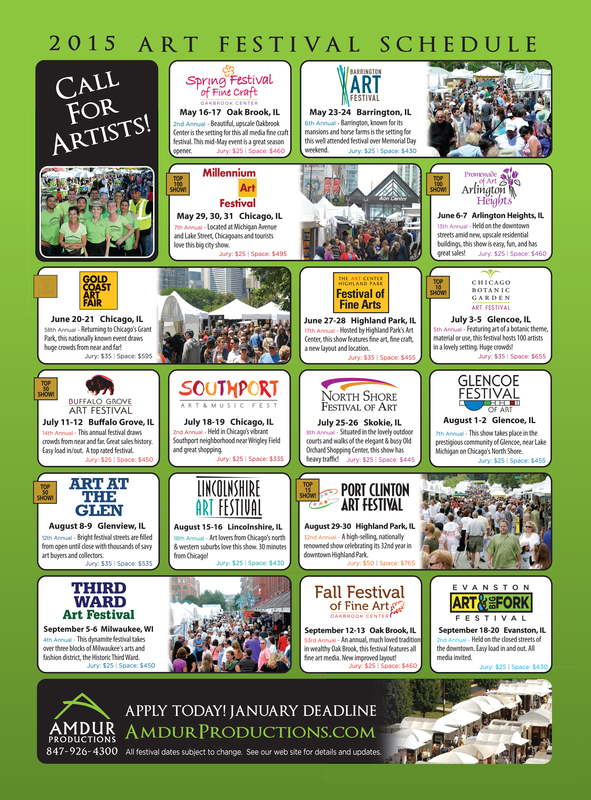 Apply for the 2015 Art Festival Season! Applications are up for 2015 Amdur Productions’ art festival season. Apply today here! Our line up includes: Spring Festival of Fine Craft at Oakbrook Center, Barrington Art Festival, Millennium Art Festival, Promenade of Art Arlington Heights, Gold Coast Art Fair Grant Park, The Art Center’s Festival of Fine Art, Chicago Botanic Garden Art Festival, Buffalo Grove Art Festival, Southport Art Festival, North Shore Festival of Art at Old Orchard Shopping Center, Glencoe Festival of Art, Art at the Glen Town Center, Lincolnshire Art Festival, Port Clinton Art Festival, Third Ward Art Festival, Fall Festival of Fine Art Oakbrook Center, Evanston Art & Big Fork Festival.